Shoulder rehab exercises to improve mobility are slightly different from range of motion exercises. When I talk about mobility with my patients, I refer to joint motion, and restrictions that are caused by joint tightness. In the shoulder, mobility restrictions can be caused by the joint capsule. Mobility restrictions in the thoracic spine can also lead to mobility issues in the shoulder. The most common mobility restriction that I see in my patients is in the posterior shoulder capsule. Tightness in this part of the joint will cause several problems in the shoulder. A tight posterior capsule will result in decreased internal rotation. Sometimes referred to as Glenohumeral Internal Rotation Deficit, or GIRD, this restriction can cause problems like shoulder impingement syndrome, and may lead to rotator cuff tendonitis. There are two ways to improve posterior capsule mobility. The first is a simple cross body stretch. To perform this stretch, simply pull your shoulder directly across your body, trying to pull your elbow as close to your shoulder as you can. Hold for 10-15 seconds, repeat 5 times. This stretch can help improve your posterior capsule, however, it is not as effective as the sidelying posterior capsule stretch because it does not stabilize your scapula. The sidelying internal rotation stretch is a much more effective way of improving mobility of the posterior capsule. 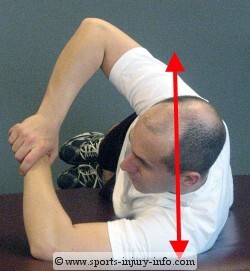 This is the shoulder stretching exercise that I give my patients to work on at home. 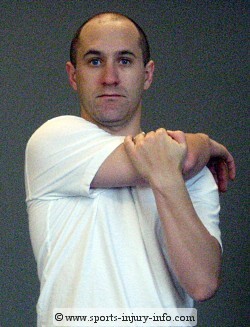 To perform this shoulder rehab exercise, begin by lying on your side, with the shoulder to be stretched on the bottom. Your lower arm should be out in front of you, and your elbow bent to 90 degrees. Make sure that your shoulders are straight up and down, as the red arrow indicates in the picture to the right. If you are leaning too far backward, you will not be able to effectively stretch the capsule. Once in this position, use your other hand to pull your arm down towards the floor or table. This produces internal rotation of the shoulder, and will stretch the posterior capsule. Your scapula will be stabilized because you are lying on your side. You should feel this stretch in the back of your shoulder as you pull. One area of shoulder rehab exercise that is often overlooked is the thoracic spine. Believe it or not, the mobility of the thoracic spine plays a huge role in how much shoulder mobility and motion you have. Our daily lives tend to leave us in a poor posture position, with rounded and slumped shoulders. This lack of thoracic extension can translate to loss of shoulder mobility, especially with flexion overhead. To improve thoracic mobility I like to use a foam roller with my shoulder rehab exercises. This is a great tool to improve extension in the thoracic spine. It is not the most comfortable exercise, but it works well. To perform this exercise, start off lying on the floor with the foam roller positioned just below your shoulder blades. Place your hands behind your head, and then slowly relax over the foam roller, letting your head drop as close to the floor as you can. Hold this position for 10-20 seconds, and then slowly sit up. Roll yourself a little farther back, so the foam roller moves down your spine, and then repeat. Work your way down your spine and then back up, holding each stretch for 10-20 seconds. 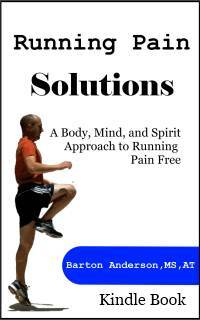 Improving mobility is essential to restoring normal range of motion and shoulder function. Shoulder rehab exercises should focus on some type of capsular stretching, as well as improving thoracic extension.